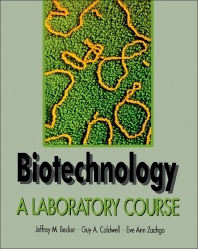 Biotechnology: A Laboratory Course is a series of laboratory exercises demonstrating the in-depth experience and understanding of selected methods, techniques, and instrumentation used in biotechnology. This manual is an outgrowth of an introductory laboratory course for senior undergraduate and first year graduate students in the biological sciences at The University of Tennessee. This book is composed of 19 chapters and begins with some introductory notes on record keeping and safety rules. The first exercises include pH measurement, the use of micropipettors and spectrophotometers, the concept of aseptic technique, and preparation of culture media. The subsequent exercises involve the application of the growth curve, the isolation, purification, and concentration of plasmid DNA from Escherichia coli, and the process of agarose gel electrophoresis. Other exercises include the preparation, purification, and hybridization of probe, the transformation of Saccharomyces cerevisiae, the transformation of E. coli by plasmid DNA, and the principles and applications of protein assays. The final exercises explore the ?-galactosidase assay and the purification and determination of ?-galactosidase in permeabilized yeast cells. This book is of great value to undergraduate biotechnology and molecular biology students.